Over a decorated 21-year career in the Army, Lt. Col. Lawrence Camancho has been called to serve in many exciting locales. Bosnia, Egypt, Iraq…and in 2015 he arrived in Philadelphia, where he ran Drexel’s campus Army ROTC program and taught military science as head of the Military Science department. In July, Camacho retired from his post to start a new career in Guam, where he will serve as the dean of enrollment management and student success at the University of Guam, his alma mater. The role will also be a sort of homecoming for Camacho, who grew up on the neighboring island of Saipan. During his time running Army ROTC, Camacho built relationships across campus to elevate the program. This included formalizing agreements at five local universities that partner with Drexel. He also established the Drexel ROTC Hall of Fame, and he reached out to other campus organizations such as the fraternity and sorority system to create new opportunities for cadets. “He has just done a phenomenal job,” Lt. Col. Stephen Messenger, who will take over for Camacho as the chair of the Military Science department at Drexel, said at Camancho’s retirement event. Camacho is also a new Drexel alumnus, having recently defended his thesis for a Doctorate of Education degree in educational leadership and management. 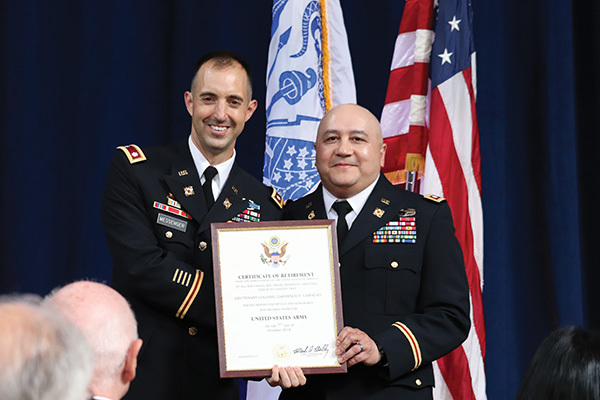 Rebecca Weidensaul, assistant vice president of Student Life in the Office of Veteran Student Services, says that Camacho’s ability to balance his academics with active duty showcases that he has naturally embraced and mastered the military’s learning culture.